Other than pizza, no dish is more connected to Italian cuisine than pasta. While it is unbelievably simple -semolina wheat and water - the process, the techniques and machinery used to make it, mean the difference between sublime and dull. You can see the rough texture of a well-made dried pasta, extruded using bronze dies. The best pasta is made from hard durum wheat, which is milled to become semolina. The quality and purity of the water is important. However, the die used to extrude, or shape, the pasta through the machine is critical. Only bronze die have slightly rough openings that create a pasta with a rough surface texture, which is essential for allowing the sauce to cling to and become one with the pasta. Pasta from a traditional Pastificio (pasta factory) will air dry their pasta instead of quick drying it in ovens. At M’tucci’s we make some of our pasta shapes (campanelle, pappardelle and ravioli) and import other shapes from an Italian Pastificio (Spaghettini, Penne, Orzo, Fettucini and Tortelloni). All of our house made pastas use two kinds of semolina from durum wheat, one a fine grind and one a course grind. Our Italian pasta machine is fitted with a bronze die for each shape. One of our favorite shapes is the Campanelle, trumpet-shaped pasta that is perfect for holding sauces, like Shrimp Campanelle with a lobster cream sauce. We make our Pappardelle with egg, which is the traditional way that it is made in Emilia Romagna (Pappardelle all Uovo). Egg pastas have a slightly silkier texture and are perfect for butter or cream sauces, such as our Pappardelle all Crema di Porcini. We partially air dry the pasta for use in the restaurants and for sale in the Market. Use a large, lightweight pot which will bring the water to a boil more quickly. Have the sauce ready to toss with the pasta immediately. It’s important to toss the pasta with your sauce, so it is coated with the sauce and the flavors are allowed to blend. Don’t dump the sauce on top, like my mother used to do. You’ll be happy with the results. Buy the best pasta that you can afford. Sprouts and Whole Foods both carry very good organic pastas that have been fabricated at artisan Pastificios. DeCecco is another good brand. Look at the pasta closely before buying. Does it look like the pasta at the top of the page? Fresh Sourdough, made with our 100 year-old starter is ready each morning. Don’t miss the opportunity to taste a truly unique beer from Upslope, the Sazerac Style Rye Ale. For a limited time it’s on tap at Italian and Moderno. This is a limited release and won’t last long. Post a photo on your Instagram Feed or your Facebook page, use the hashtag, lovemtuccis, and you’ll be entered in the monthly photo contest. The winner receives a $50 Gift Certificate. Don’t forget, quality counts, so edit your photos for proper light and exposure. 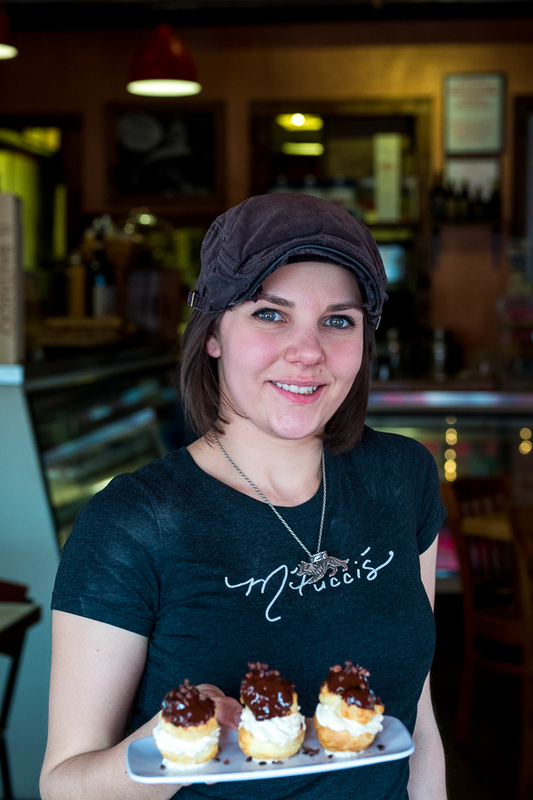 Market - Lauren has been a pastry chef for several years, working primarily at the Market & Pizzeria. She is responsible for the creative cookies and pastries that you’ll find in the deli counter. Moderno - Michelle is our lead Pastry Chef, creating the house made desserts for Italian and Moderno. Italian - Taña is one of the servers and bartenders at Italian and has been with us for many years. April 21, EASTER SUNDAY - Don’t forget to make reservations for Easter at Italian and Moderno. We’ll be serving our regular brunch menu from 11:00 - 3:00. We’ll announce a few specials later in the week. May 31, 6:00pm - 9:00pm: Beer Week - Beer & Food pairing with Dialogue Brewing and M’Tucci’s Market & Pizzeria. Four courses and four beers for $40. Tickets available at the Dialogue Taproom. Thanks for taking your time to visit. You may subscribe to receive an email when the Blog Posts are published each week. Ciao!